Look at the pictures below. The picture on the left is a lettuce robot. It travels down the rows and picks heads of lettuce. The picture in the middle is a strawberry robot. The robot travels around the strawberry plants and gently picks ripe strawberries with it foam fingers. The picture on the right is a GPS in a combine harvester. This is used to drive the combine down the rows to maximize the harvest in the most efficient manner. So what is in common with these three items? They all do work and reduce the number of workers needed to complete tasks that used to be completed by people. Today in agriculture and business, more and more tasks are being accomplished using technology, which requires fewer workers. The architect may have ¼ of the staff he had in the past, as he relies on CAD equipment instead of a large group of draftsmen. Factories are now staffed with robots, where they used to be filled with people to complete tasks. Credit Unions operate with less tellers and staff, as more people use other ways like online banking and ATMs to access their money. This is both a blessing and a curse on the US Economy. The blessing is that we are the most productive country in the world. The curse is that it will continue to take fewer workers to create the same economic output. Note the chart below of industrial production and employment. Note in 2009, the US had $600B of labor costs for $2.4T of industrial output. This is by far the most productive economy in the world. This trend has been continuing for years, as is shown in the next chart. More and more GDP goes to capital and less and less to labor. So when you hear about manufacturing returning to the US, which it is, that may not translate into the same increase in labor as it did in 1970 or even a decade ago. In the 1950s, a young man could get a job in Detroit, attaching the rear wheel to cars as they go down the assembly line. He could make a career with that job and make a nice living for his family by just doing that one task. Now, that same job is handled by robots, which do not require all the costs of benefits and salary the worker does. The economy has changed. We now live in a world economy where globalization and high technology will leverage top talent. The talented can now be seen and demanded by a world audience instead of a smaller local or regional one. Areas that were completely closed to capitalism in 1980, like the old Soviet Bloc, China and India, have now embraced it. This has created a larger supply of labor around the world and has also created many more customers. Highly demanded processes can reproduce at a breakneck rate like Amazon, Starbucks, Wal-Mart and Apple apps. Top CEOs and professionals will use the world market to bid up their income. This equates into a growing gap between those in demand and the ordinary worker. Today, it is important to grow and acquire skills that are in high demand. This could make the difference between financial struggle and success. I would encourage everyone to study the chart below. 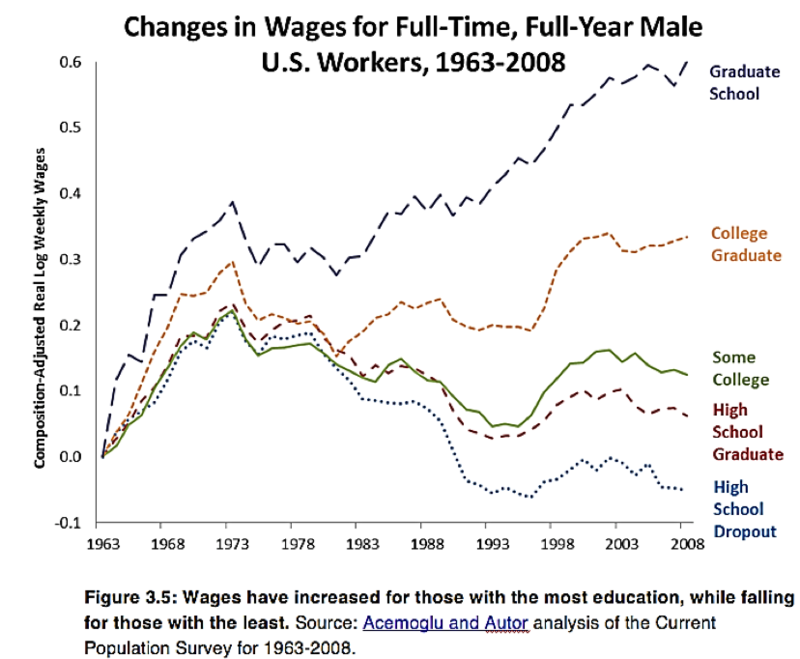 Note the difference in wages between changes in wages among the highly educated and those with the least. We all know a graduate degree will not guarantee success, and there are those dropouts that occasionally end up on top; nevertheless, it is still important to gain as much training and skill sharpening as you can to develop talents that will be in high demand in the coming years. Older PostThe US Economy: A Good Future?